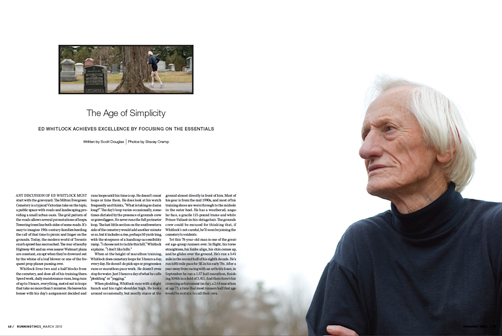 In late November of 2009 I travelled to a sprawling suburb west of Toronto to photograph the subject of a Running Times feature in the March issue of the magazine, which is now on the newsstands. Runners profiled in the magazine all have something special about them, but this one just may take the cake. 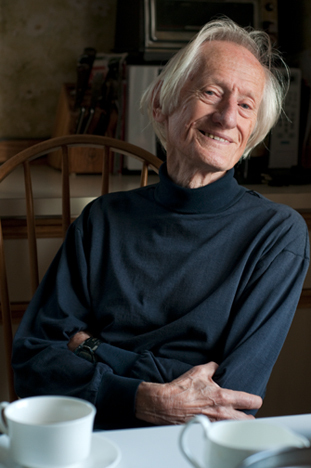 The subject was 78-year-old Ed Whitlock, a legend in the world of running whose many accomplishments include a 5:41 mile in the second half of his eighth decade and a 2:54 marathon at age 73, both age-group world records. Amazing, right? But there’s more. Whitlock trains ONLY on a short (no more than 5-minute) loop in a graveyard two blocks from his home. He runs round and round in circles day after day, not varying his speed, just plodding along for an allotted time, which can be anywhere from 20 minutes if his arthritis is bothering him to 3 hours when he is healthy and preparing for a marathon. You should read the full story to get a really good sense of Whitlock’s attitude and approach. The writer, who happens to be my husband, does a marvelous job of capturing his spirit. Better yet, pick up a copy of the magazine to get the full effect of the photos, which ran large with lots of room to breathe. (Above is an image of the opening spread.) Moxie Sozo did a great job with the layout. It reflects what Whitlock is all about: austerity and simplicity. I think this story is an excellent example of writing, photography and design working in concert. Too often in publications one of those three elements is lacking and it takes away from the impact of a story. For a photographer, there are few things worse than taking photos that you are happy with and then seeing them severely cropped or run postage-stamp size or covered with too much type in the layout. On the occasions when everything works well together, I get all warm and tingly and feel so glad and proud to be able to call myself a photographer. This entry was posted in running and tagged Ed Whitlock, master's running, running, Running Times on February 24, 2010 by Stacey Cramp.